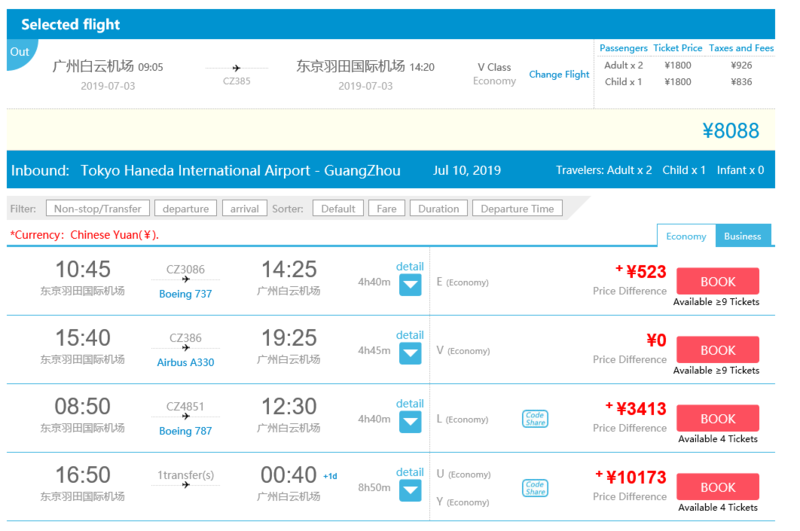 I am a Canadian with a Chinese background (so I am bilingual English/Chinese), and some of my family members are planning on a vacation to Tokyo, Japan, and the flight is a direct flight originating in Guangzhou, China. It is scheduled for early July of this year. Anyone with access to a currency converter knows that C$1 948.50 is worth 21.4% more than CN￥8088. So, how is it possible for 2 identical services can be worth 2 very different prices when purchased at the same time on 2 different websites? I thought that arbitrage causes (or should cause) the prices of the 2 sides to equalize pretty quickly, given the popularity of Japan as a general destination for Chinese people. Airlines do their level best to make arbitrage on flight tickets impossible -- exactly so they can keep doing things like this: charge different fares from different travelers, based on things they think can help predict how much each traveler is willing to pay. In this case, which currency (or which language or which website) the ticket is bought in. The main way to frustrate arbitrage is that tickets cannot be sold onwards after first being bought, because you have to state the passenger's name at booking, and this name is expensive or impossible to change later, and they actually check it against official ID when you board. The net effect of this is that travelers who are expected to be willing to pay a lot (say, businessmen from a wealthy country) subsidize the travel of people who are more price sensitive (say, vacationers from a comparatively less affluent country). It is market segmentation. Airlines want to have larger profit as possible. Old economic model tell you that there is an optimal spot between demand and prices (with higher prices you may get less passengers, but the passengers you have pay more, so possibly you gain more). But since many years (initially on car rentals, then hotels), with more data, companies have found methods to "segment" the clients. So you may try to offer more expensive tickets to people who will pay for it (country, language, currency, and first number of a credit card are common methods, but now with web tracking us, there are more methods). If they offer cheap prices to the most rich nation, they get less profits. But with higher prices, you may increase the income, but you will have empty seats, so you offer them on other markets (which should not effect prices on the main market). Note: market segmentation is also a reason of business ticket prices (also on economic class: more flexibility, more price, but you are in a business travel). This is also the reason why you may find flight with stop-over more cheap (e.g. A to C via B, but just A to C or also B to C are more expensive): some people can afford to pay, but you can fill the airplanes without need to reduce prices for the first group. Note: For flights (and car rental and hotels) this is the norm, and nobody complain. Amazon 15-20 years ago tried a similar method for book, but it had to suspend itquickly: people were not "ready" for such segmentation. Not the answer you're looking for? Browse other questions tagged exchange flight-search-engines or ask your own question.